Saint Laurent wool pants with ribbon tux stripe. Front & back welt pocket. 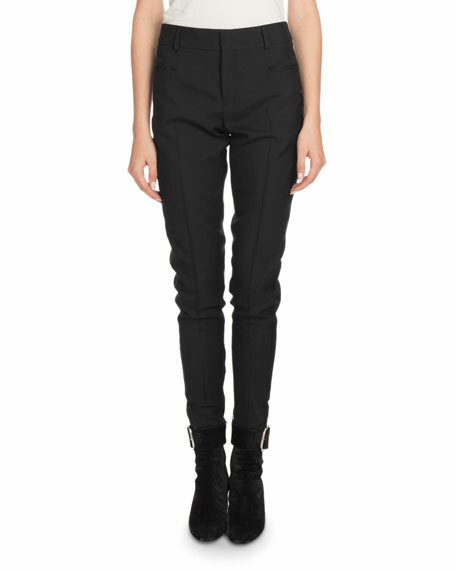 Alice + Olivia "Jinny" pants. Approx. measurements: 10.1" front rise; 14" back rise; 35.3" inseam; 45.6" outseam. Mid-rise. Fitted through hip and thigh. Flared legs. Full length. Side zip. Micro polyester/spandex. Imported. Model's measurements: Height 5'11"/180cm, bust 32"/81cm, waist 25"/64cm, hips 36"/91cm, dress size US 2/4. 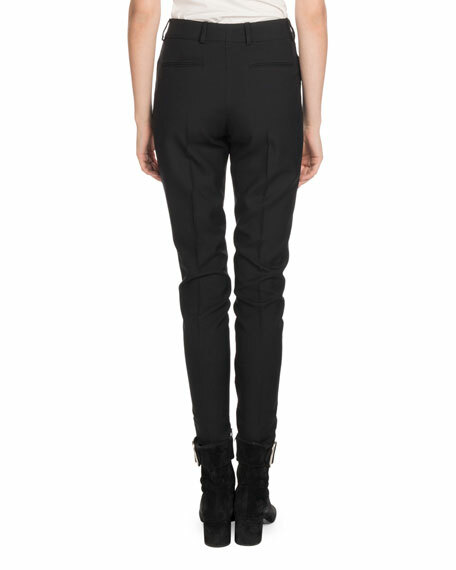 EXCLUSIVELY AT NEIMAN MARCUS Anatomie "Amanda" pants in lightweight UV protection fabric. Approx. 34" inseam. Boot-cut legs. Button-tab/zip front; belt loops. Nylon/spandex. Machine wash. Made in Romania. Model's measurements: Height 5'10"/177cm, bust 33"/84cm, waist 25.6"/65.2cm, hips 35.8"/91cm, dress size US 2-4/FR 34-36. Brock Collection "Pamela" floral-print silk crepe de chine pants. High-rise; flat front. Side slip pockets. Back besom pockets. Slim fit. Brock Collection "Pamela" floral-print silk crepe de chine pants. High-rise; flat front. Side slip pockets. Back besom pockets. Slim fit. Wide legs. Made in USA of Italian materials. Model's measurements: Height 5'10.5"/179cm, bust 32"/82cm, waist 23.5"/60cm, hips 34.5"/88cm, dress size US 2. Brunello Cucinelli jogger-style pants in wool windowpane plaid with monili side stripe. Elasticized waistband. Side slip pockets. Relaxed fit. Tapered legs. Pull-on style. Cropped at ankles. Lining, polyester/acetate/cupro. Made in Italy. Model's measurements: Height 5'10"/177cm, bust 31"/79cm, waist 24"/61cm, hips 34"/86cm, dress size US 0/2.